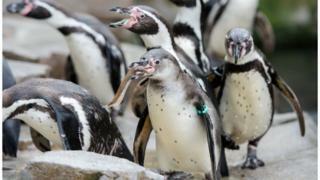 A zoo in Canada is investigating the drowning of seven of its Humboldt penguins. Officials at Calgary Zoo are perplexed as to how the aquatic birds drowned in the Penguin Plunge exhibit and called it "devastating news". In recent years a number of animals have died in mysterious circumstances at the zoo. Earlier this year an otter died after becoming entangled in a pair of trousers given to him by his keepers. The dead penguins were discovered on Thursday morning in their holding area. The zoo's veterinary team examined all seven birds to determine the cause of death. There were 22 Humboldt penguins within the colony, though three other species of penguin live in the zoo exhibit. Jamie Dorgan, director of animal care at the zoo, said something may have sparked a frantic panic among the penguins that could have prevented the seven penguins from being able to surface for air. He said the zoo is scouring through camera footage from in and around the penguin exhibit to see if there are any clues as to what may have spooked the birds. The back holding area where the penguins were found is not monitored by cameras. Image caption Calgary Zoo says the error leading to Logan's death was "simply unacceptable"
In February, Logan, a 12-year-old American river otter, drowned at Calgary Zoo after being given a pair of trousers to play with by a zookeeper in its enclosure as an "unauthorised enrichment item". The otter became tangled in the trousers and drowned. Two staff members were disciplined for the otter's death. In 2009, a giant capybara was crushed to death in a holding area when a zoo worker closed a hydraulic door. In 2011, a zookeeper resigned after failing to follow animal-handling instructions that resulted in the death of a corn snake from hyperthermic shock. But Mr Dorgan said that despite those deaths, the Calgary Zoo is in line with international standards and passes regular inspections. "I'm very comfortable with our record of animal care and I'm very comfortable to hold it up to any animal organisation on Earth," he said. "If something happens like this, we don't take it lightly."